This Saturday I had the pleasure of going for a blogger event. Off late various reasons made me miss a few events and I was happy to sign up as the topic was on food. Food tends to make people emotional. If you have seen me you will know that I get very emotional about food and though I still believe that the best food is always home cooked I am always ready to try out a new restaurant any day. The invite intrigued me because it wanted 5 food bloggers and 5 tech bloggers & the event was in an IT park so my curiosity levels went up. The venue was the office of M/s Owl Tech blew me away. The exposed brickwork, furniture made from stacking pallets among others made it a good place to be in. I met up with a few familiar faces and some new faces and we settled down to learn about the place and the event. The Ice breaker! Note the table made of pallets. So we got down to business the food part. We were taken to the cafeteria of SP Infocity where we saw the working Frshly machine awaiting us. 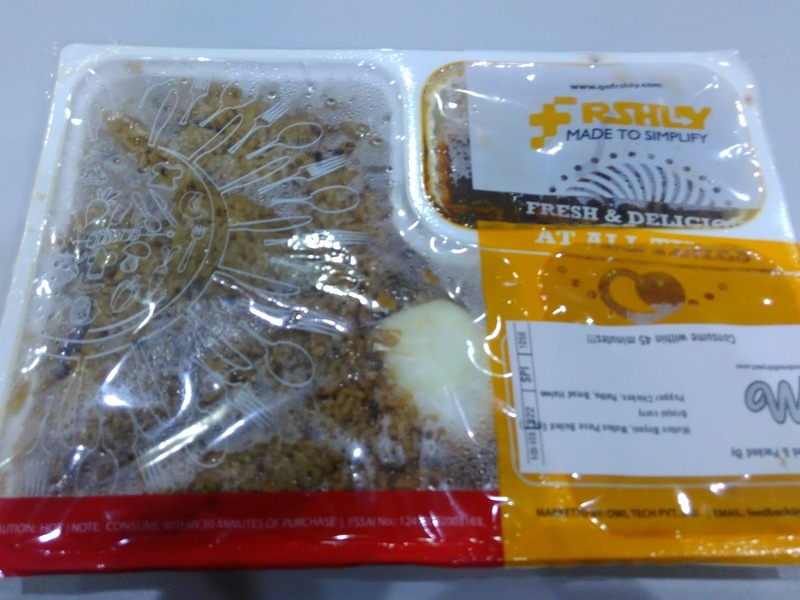 To keep it simple, Frshly aggregates food from chosen vendors in standard packing which are loaded in the machine. 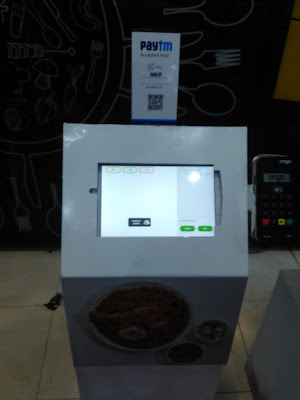 When a consumer wishes to make a purchase he sees the options and the inventory displayed above and makes his / her choice of the touch screen before the kiosk / machine. Once the order is accepted and the payment made with any of the digital options available the machine starts to work. The trays are moved from the stack and moved to the microwave where they are heated and sent to the pickup point of the machine in 90 seconds. The other order options are oline and through their app. The cola bottle vending machines in the airports would be the earliest cousins of Frshly. - The food is chosen after a lot of homework. Satish being a foodie helps. - The portions are decent sized and will ensure that no one will go back to the work station dizzy with food. I observed the working of the machine and was happy to hear that the impressive machine was made in my home town Coimbatore. Since the group was predominantly vegetarian the hosts had planned and stocked the food accordingly in the machine. 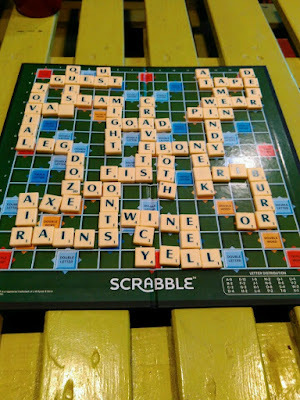 Dilli Highway came highly recommended by the vegetarian friends and from the reactions it seemed that they were happy. I was very curious about the Engineer Biriyani by Madarasi Biriyani. I am not a big fan of the term Madrasi but reserved my judgement for the food. Made from the seeraga samba rice variety the mutton biriyani was good. The accompaniments including the brinjal curry and the chicken curry were also good. They also had a bread halwa that was an additional order and I was pleasantly surprised with its consistency and the relative absence of oil or ghee. Usually I stay away from these desserts that seem to float in oil but this was a pleasant surprise and in no time I finished it all. I also tried the Anjappar chicken biriyani combo that came with a parotta in addition to the curries and the raitha. Compared to the other biriyani the curries seemed to have more oil and the masala was in true Anjappar style. It can be a minor challenge for a first timer. For Anjappar regulars it felt like home. During lunch I had the pleasure of picking Satish’s brains and I was quite impressed with the whole conversation. What started off as a typical challenge for him like most train travellers in India was finding clean, quick, hot food during the journeys, this challenge eventually culminated into Frshly. I was informed that the Indian Railways has a large part of their future plans. I also learnt some more details about the economics of the whole project but that is beyond the scope of this post. The plans ahead for Frshly are quite big and the Indian operations are a small part of their overall plan. So what makes Frshly a great idea? 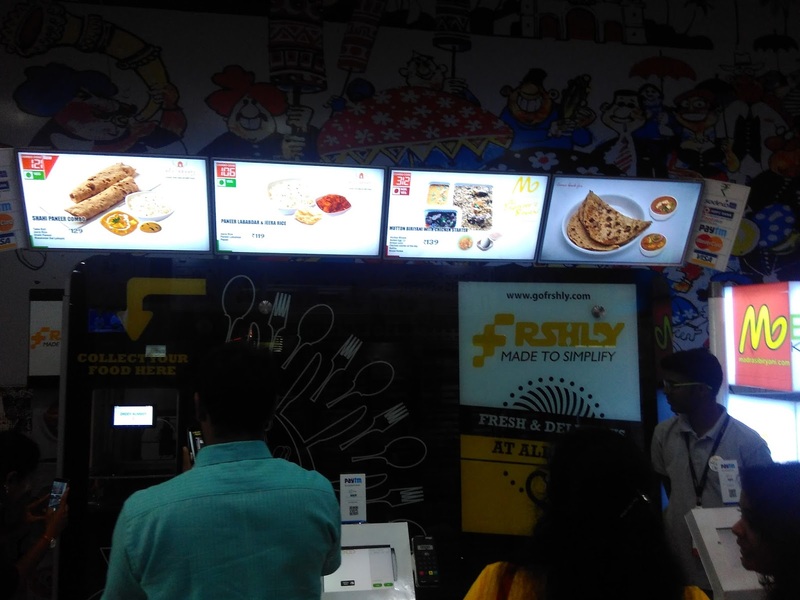 Currently Frshly is present in Chennai and Bangalore in the cafeterias of many IT parks and is quite popular as attested by one of the bloggers who attended the event. Since power and the internet are essential to its working it is a natural fit in these cafeterias. So if hunger strikes you, Go Frshly!! !